Can You be Your Own Chiropractor? Does Chiropractic Help With Shoulder Pain? At least once a month I get a question from a patient asking some version of “Why can’t I just adjust myself?” And more often, I have patients that regularly do adjust themselves, particular grabbing their own head or neck and performing a maneuver that gives them a bunch of “cracks” and makes them feel like they’ve done something good. There are probably more reasons than what I’ll list here, but the answer is “no” you can’t be your own chiropractor. You can be your own mechanic (to a point), you can be your own handyman (to a point), you might even be your own doctor at times, but you leave the more specific and more complicated tasks to the experts. Getting a spinal adjustment is one of those complicated things that doesn’t seem so complicated on the surface. What is it that the chiropractor is really doing? 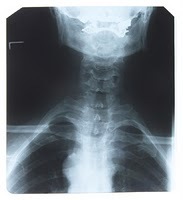 Why do I need to have a chiropractic adjustment, what’s wrong with just twisting my own neck? Each vertebrae can move up to sixteen different directions. Do you know which way your vertebra has gone? That’s where the chiropractor comes in. They are trained to determined which way the bone has moved and how to move it back into the correct place. Some of the directions are extremely difficult to accomplish on your own. Chiropractors don’t adjust themselves either! The same principle that applies to adjusting yourself also goes for having someone “bear hug” you at a family gathering and having your kids walk on your back. It’s just not specific and the person performing the “therapy” has no way of knowing which part of your spine needs to be adjusted. You’ll notice that when you do it, the good feeling doesn’t last long. That’s why you keep doing it over and over again during the day. You still get the endorphin release, so you’ll temporarily get a influx of pain relief that makes you think you’ve done something good for yourself. However, you’ve more likely either moved something the wrong way or moved a different bone than the one that needs it. The pain and discomfort returns once the endorphins are gone and you’re back to where you started. In summary, you cannot be your own chiropractor. I know it can seem like a simple thing, but chiropractors are the experts at finding the right area of your spine to be adjusted and then moving it back the right way. See the experts!